Kirti Ranchod, Neurologist. Writer. Explorer. Art helps you to heal and to transform. I love galleries. Visiting galleries as a child with my parents, created a lasting affection for them. I remember visiting the Van Gogh museum, and I felt like I knew Vincent. Was it really a sense of knowing myself better? As I got older, I became aware of the impact that these visits had on me. I noticed that viewing art made me feel and think differently. On one of my visits to WAM (Wits Art Museum), in Johannesburg, I visited the ‘Stars of the North Exhibition’ which focused on sculptors from the north of South Africa, including Noria Mabasa, Jackson Hlungwani, Johannes Maswanganyi, Philip Rikhotso, Phutuma Seoka, and many more. As a neurologist, with an interest in brain health, I was intrigued by the biography of Phutuma Seoka. Mr Seoka, visited a traditional healer in his community to help him with his recurrent nightmares. The traditional healer advised that he sculpt, and a brilliant sculptor was born. This advice was profound. Sculpting made a subconscious concern visible.It provided a tangible way for Mr Seoka to deal with whatever was worrying him. In his TED Talk, Laolu Senbanjo, talks about the power of beauty, of art, and of its impact on the human spirit. He was inspired by the childhood memories of his grandmother, and her beautiful, traditional tattoos. As a lawyer working at the Human Rights Commission, he constantly faced the many injustices of the world. He started to paint to help him to cope and it changed his life. Art has been used in traditional practices throughout the world. Traditional healers understood that art can be used to heal. Neuroscience is beginning to explain how. Art stimulates a particular network in the brain called the Default Mode Network (DMN). This network, consists of different parts of the brain that work together when the brain is resting, including during meditation and day dreaming. This network is important in self-reflection, the memory of personal events, and understanding the perspective of others. Art stimulates this network, thus assisting with self-reflection and solving problems regarding yourself. In a study by Bolwerk et al, art improved psychological resilience. Psychological resilience is the ability to cope with stress and find solutions to challenges. It does this by activating the DMN, and a part of the brain called the Medial Prefrontal Cortex. This part of the brain allows us to feel better. 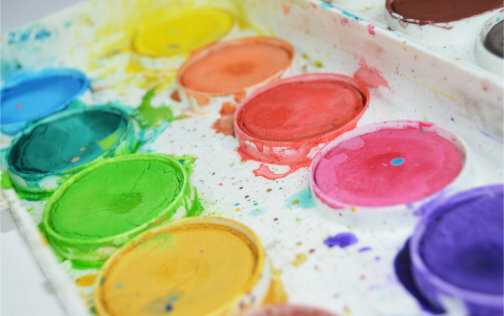 Viewing art, particularly abstract art, may create new pathways in the brain. We can then tap into different ways of thinking, emotional processing, problem solving and creativity (Jonathan Fineberg- Modern Art at the Border of Mind and Brain). Start drawing. It doesn’t matter if you’re good or not, the act of drawing will help you. Consider joining an art class. Visit art galleries. Make a list of places that you would like to visit. Ask a friend to join you. Appreciate art in your home, temple, church or city streets. See beauty in the sky and trees, or the apples on your table. Make the effort. Have fun. You will increase your ability to cope with stress and illness, and perhaps enjoy everyday pleasures a little more.